Vaccinations are touted as the public health preventive measure of choice - the must-do in preventive medicine. There is little or no surveillance once a vaccine has hit the market, particularly for the vaccines that were introduced decades ago. And there is reason to believe that much of the touted success of vaccines is due to tricking the statistics and to independent external factors such as better hygiene. Yet, with all that preventive fervor, our health keeps deteriorating. Autism is on the rise, so are cancer and heart disease and a number of other illnesses that should, if we logically look at it, be possible to prevent. While there is much evidence that nutrients are needed for prevention of illness, the emphasis of pharmaceutically controlled medicine and public health authorities remains firmly fixed on toxic pharmaceuticals, both in prevention and cure. The trend is rising. Having saturated the "markets" of the industrialized nations, a great push is on to extend the saving grace of our brand of medicine to developing countries. Vaccine victim and health campaigner Jagannath Chatterjee describes what is happening in India, how in a rather mindless way the "preventive" procedures of Western medicine are being put into effect there. His description is quite representative for what is happening in a number of developing countries, and he asks some pertinent questions. To Heal or Not to Heal: Is that the question? "The public has many questions about the safety and efficacy of vaccines. While more parents are showing increased concern about these issues and the growing number of vaccines to be administered to infants and children from day one of life, there is a growing interest on the part of vaccine manufacturers, state legislatures and medical societies to enforce vaccination on all children, through the passing of more and more state vaccine mandates, without first having a dialogue with the public, or the medical community." The National Technical Advisory Group on Immunisation (NTAGI) meeting on 16th June 2008 has been one big letdown. With just a passing reference to mercury ("to explore the possibility of use of lower limit of Thiomersal"), using single dose vials for the at birth dose of Hep-B "subject to availability of resource", it moves on to more serious subjects like the introduction of the recently denounced ineffective and asthma causing Hib into the Universal Immunisation Program. It also considers the introduction of the dreaded Rotavirus vaccine (to vaccinate against diarrhea!). 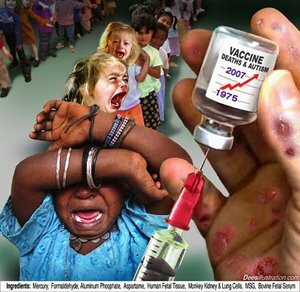 But most dangerous perhaps, it talks openly about a Japanese Encephalitis vaccine "that has not gained acceptance globally" being experimented on Indian children because, "the world is looking forward to the Indian experience." The mind revolts, the brain goes numb, the heart beats faster, and sweat glands are over-activated at the implications of such a policy. The children of India have well and truly become guinea pigs. Why should not that be? We have a qualified physician as the Health Minister. Qualified in modern medicine, he is as heartless, cruel, ambitious, intolerant, un-amenable to reason and irresponsible as any other medico today. At a class I have been recently asked the question, "What is health?". I was still wondering about it when this document came to my inbox. What is health really? I am tempted to reply, "freedom from vaccines." Health is perhaps not being worried about the body (and mind) and functioning smoothly without being aware of its presence. When the society starts worrying so much about disease that it does not think twice about injecting dozens of highly toxic substances as "preventives" into its young infants, then that society is sick beyond measure, beyond reason and perhaps beyond help. Is it so difficult to prevent disease? It is not - provided one understands what disease is. Disease has very little to do with the ubiquitous bacteria and viruses. Disease is an imbalance that starts when man goes against the laws of nature. This imbalance lets loose a change in the physical sphere, taking the shape of pain and unease, sending out the signal that things are wrong. The physician's duty is to alert the patient and lead him back to the state of balance. When the mind, emotions, and the body fall in line once again to the basic laws, health is restored; true healing has taken place. Except for modern medicine all the other methods of treatment recognise this truth. Modern medicine blatantly ignores this and adds to the imbalance forcing ailments that come to the surface to go deeper into the body and mind. Chronic illness and organ changes result. Do the modern medicos not realise this? They do. Modern research increasingly points towards the deviant mind being the root of ills that plague mankind. However modern medicine is not geared towards good health, it thrives on sickness. The pharma industry has to grow at the rate of 25% or more annually. This cannot be achieved unless there is a 40% rise in illness every year. To the doctor thus appears the dilemma, to heal or not to heal? It is very difficult to avoid the easy life that pharmaceutical incentives offer. It is very tough to take the right decision. I can already hear the question coming. What about epidemics? I will ask a question in return, can you show me one epidemic that is not the result of some disturbance on a mass scale? The epidemics that have reared their heads in recent memory have come after wars, after large scale immigration that led to squalid conditions, that led to malnourishment. Modern epidemics, including polio, can be traced to poverty, unclean conditions, lack of nourishment, and toxins that have become central to our lives. Had these not been the prime cause, and bacteria and viruses been the sole reason for disease, mankind would have been wiped off the face of the earth. The patients too should now start enquiring, "Do I wish to be healed or should I go from bad to worse in the name of a false science?" The sooner this question arises the better. Besides protecting the earth, we also need to protect ourselves and regain our stature as the guardians of the earth, the children of the earth. Let us stop playing with dangerous toys and go back to mother nature. The mother knows what is best for us, as Sri Ramakrishna has candidly confessed. "there is reason to believe that much of the touted success of vaccines is due to tricking the statistics and to independent external factors such as better hygiene." Ahh, so what's the alternative history for the elimination of smallpox? Though I agree that bacteria and viruses and other microorganisms are not the root issue here, and that disease is merely a heads-up that something is terribly out of balance in nature, I think you are oversimplifying things. All of the cells in our bodies, including those that govern our immune systems, communicate with each other via electromagnetic and/or radiowave fields. It is imperative that these processes run smoothly. Please google the Bioinitiative Report. In the early 1980's, the U.S. Air Force School of Aerospace Medicine funded a very large, very expensive study at the University of Washington, under the direction of Dr. Arthur W. Guy. In this study, rats were continuously exposed to high frequency microwaves of 2.45 gigahertz (with one gigahertz equaling one billion hertz) at approximately 0.5mW/cm2, twenty times lower than the "safe" thermal level. The exposures lasted for as long as 25 months, and 155 different measures of health and behavior were collected. This appeared to be a well-designed study that would finally answer the question of whether there were any potential hazards to human beings from chronic exposure to microwave radiation. According to Guy, "The results revealed few differences between the exposed and control rats, and those differences for the most part were either not statistically significant or came and went, suggesting that they may be due to chance." However, one striking observation was noted: "Primary malignant tumors developed in eighteen of the exposed animals but in only 5 of the controls." Guy hastened to explain that the incidence of cancers even in the experimental group was actually lower than normally expected for the strain of rat used in the experiment. He suggested that no hasty conclusions should be drawn, and that a "consensus among most investigators that the only strong evidence for the hazards of microwaves is found at high levels of exposure" was still valid. The project was wide reported in the press and discussed in scientific meetings, and it was the subject of a major article in the September 1986 issue of Scientific American (from which the quotes have been drawn). A significant aspect of the experiment was not reported either in that article or in the popular press - but at the scientific meeting at which the results of the study were first reported, it was revealed that all of the animals used, both experimental and control were gnotobiotic (a term meaning germ and virus free). This circumstance alone was responsible for a major part of the $5 million cost of the project. To produce gnotobiotic animals, the young must be delivered by cesarean section under the strictest possible sterile operating-room conditions (much more stringent than those in use in operating or delivery rooms for people). Following delivery, the animals must be raised and then housed in totally sterile environments for the entire duration of the experiment. This type of environment is akin to the decontamination rooms used to house the astronauts after they returned from the moon, or the "bubbles" within which children born without immune systems are housed. The use of gnotobiotic animals seems to be not only totally unnecessary, but undesirable as well. Neither we nor the laboratory rat normally live in a sterile world, devoid of bacteria or viruses. On the contrary, we live surrounded by uncountable numbers of organisms. We generally do not get sick unless we are injured and bacteria enter the body through the wound, or unless our immunity is inadequate and we get a communicable disease or infection. An experiment on germ- and virus-free animals has no relevance to the real world. The point becomes even more apparent when two established facts are considered. First, present evidence shows that at least 20 of human cancers are caused by viral infection, and the percentage is considerably higher in animals. Therefore, animals that are maintained in a germ- and virus-free state have an incidence of cancer that is much lower than expected. Second, it is well-established that exposure to any abnormal electromagnetic field produces a stress response. If the exposure is prolonged, the stress-response system becomes exhausted, and the competency of the immune system declines to below normal. In such a state, animals and humans are more susceptible to cancer and infectious diseases. One can only conclude that the experiment at Washington was deliberately designed to sharply reduce the incidence of cancer and infectious diseases in the exposed animals. There can be no other reason for the requirement that the animals be gnotobiotic. Therefore, if we knew the facts in advance, and we wanted to set up a "scientific" project to expose animals to microwaves for a long time but were required to get negative results, we would have only one choice - to use germ- and virus-free test animals. Being gnotobiotic, both the unexposed control animals and the exposed experimental animals would be protected against the usual dangers of infection and cancer. In Guy's study, the fact that the experimental animals had a lower-than-normal incidence of cancer was totally expected. What was unexpected and highly significant was that even with this protection, the cancer incidence in the animals exposed to microwaves was four times that in the control animals. The well-designed experiment that should have "proved" that microwaves are safe fell into a trap, and the nature of the trap is revealed by the types of cancer that occurred in the experimental group. These were mainly limited to cancers of the pituitary, thyroid, and adrenal glands; these cancers were accompanied by a significant number of pheochromocytomas, which are benign tumors of the adrenal glands. There were no significant cancers of any of the usual tissues. The experiment was designed to prevent the results of stress, but the planners forgot that it would produce stress. Because stress resistance is mediated chiefly through the three glands just mentioned, we must conclude that the microwave exposure produced an extremely high level of stress - so much so that the resultant prolonged hyperactivity of these glands led to their becoming cancerous. Considering the extreme stress experienced by the exposed animals, if the animals had been normal (rather than gnotobiotic) the entire experimental group would have died of infection or cancer before the close of the experiment. Some of the 155 biochemical determinations done by Guy in the course of the experiment confirm this interpretation. Plasma cortisol is one of the chemical substances produced by the adrenal glands under conditions of stress, and it was one of the substances measured in the experiment. At the start, the plasma cortisol was equal in both the control and experimental groups; in the early months of microwave exposure, however, cortisol in the experimental group was elevated above that in the control group, indicating that the experimental animals were reacting to stress. By the latter phase of the experiment, the plasma cortisol of the exposed animals was depressed below that of the controls, indicating that the stress response systems of the experimental animals had become exhausted. This result is exactly as expected for a condition of chronic stress. These data, which are buried in a multivolume official Air Force report of the project, were first published in the July-August 1984 issue of Microwave News. The experiment was planned cleverly, but not cleverly enough. It clearly indicated that chronic exposure to microwaves at levels 20 times below the established safe thermal level, produced profound stress and ultimately exhaustion of the stress-response system. Because the experiment involved gnotobiotic animals, this resulted only in an increase in cancers of the stress-response glands. Had the experiment been performed under real world conditions, the result would have been catastrophic for the exposed group of animals. Only 10 per cent of the population was vaccinated against smallpox...yet vaccines claim all the credit for eradicating the disease. The facts are that all diseases were sharply in decline due to sanitation and nutrition BEFORE the event of vaccination as it is today. Read these stats in this book : VACCINES: ARE THEY REALLY SAFE AND EFFECTIVE? By Neil Z. Miller. Also, vaccination works by suppressing, confusing and destroying the immune system. Therefore we no longer catch infectious diseases. Instead we get Cancer, diabetes, autoimmune diseases, and a plethora of other diseases including death by vaccination. Me for one one have rather had chickenpox. "vaccination works by suppressing, confusing and destroying the immune system"
"we get Cancer, diabetes, autoimmune diseases, and a plethora of other diseases including death by vaccination"
We get those disease from life style choices and because vaccines have extended the lives of people. This allows them to live longer and reach the age range when those become problems. "The facts are that all diseases were sharply in decline due to sanitation and nutrition BEFORE the event of vaccination as it is today"
The fact is infectious diseases did not appear until in many cases until the domestication of livestock and the building of civilization. But nobody wants to return to the Dark Ages of early human existence.